Creating your PropellerAds Advertiser account is as easy as 1-2-3. Follow these simple steps and start your first ad campaign with us today! 1. 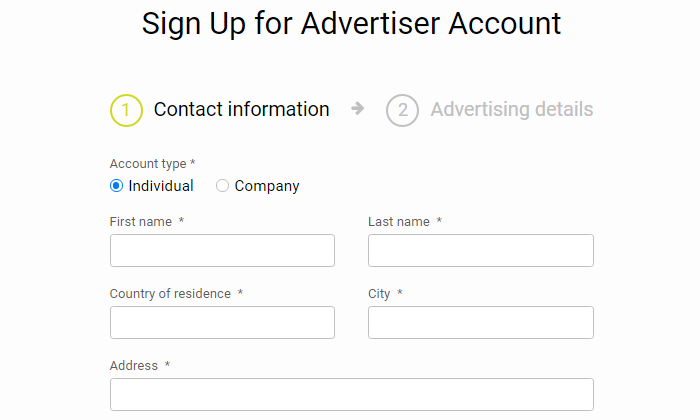 Go to the propellerads.com homepage, click the "Register" button, and choose "Advertiser" to start creating your account. You will be redirected to the registration form. 2. Choose your account type: Individual or Company. Select "Company" if you are a company representative. 3. Fill out the form with your name, address, city, and country of residence. Use only Latin characters (A-Z) and numbers. All of the fields marked with an asterisk (*) are required. 4. 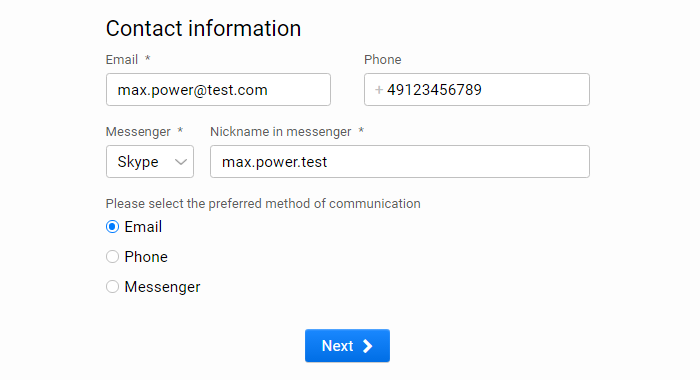 Add your contacts, select your preferred method of communication and click "Next" button to submit your information. 5. 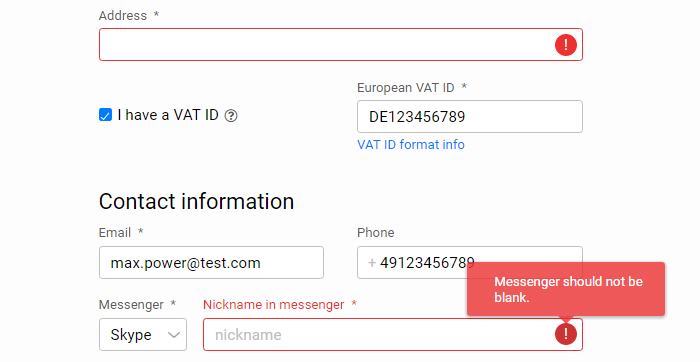 If you have filled anything out incorrectly or missed a field, the error be highlighted in red. Please correct the information and click "Next" again. 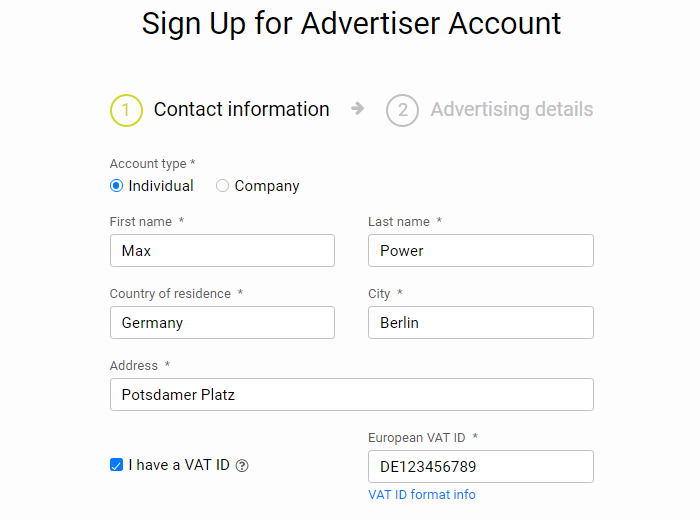 Please note: If you see the error: “Advertiser … already exists”, it means you already have registered an Advertiser account in our network under this email address. 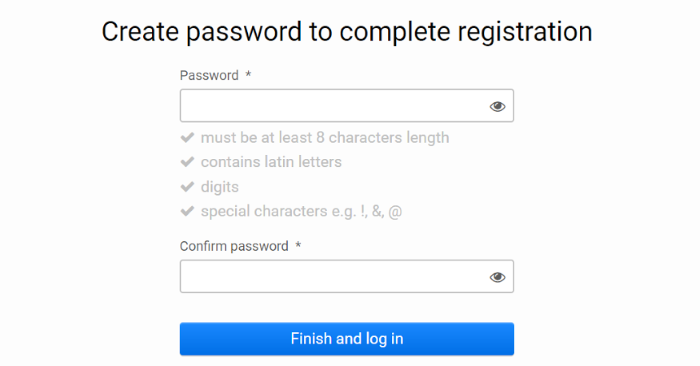 Go to the login page (click Sign in link) and use the "Forgot password" link to reset your password and restore access to your existing account. If you have any problems with restoring access to your account - submit a request to our Help Desk. 6. 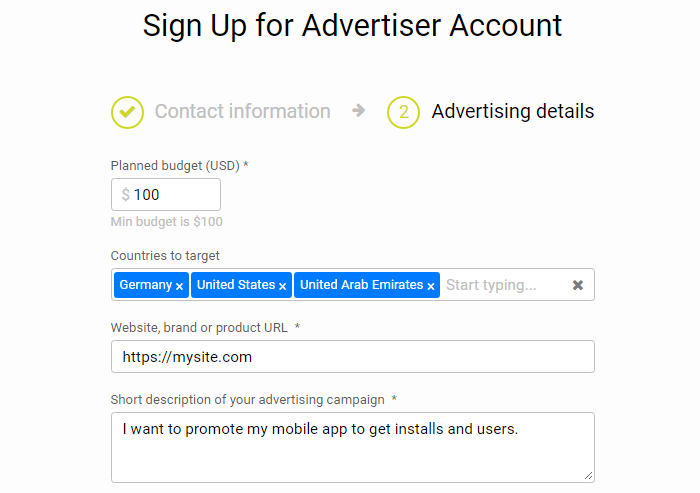 Provide us with a few more details: the website for your product or business, your planned advertising budget, and the countries you are going to target. Please note: Minimum planned budget is $100. Don’t forget to add a short description of your advertising campaign. 7. Read and accept the PropellerAds terms and conditions. Click "Sign Up" to confirm the information. 8. Almost ready! 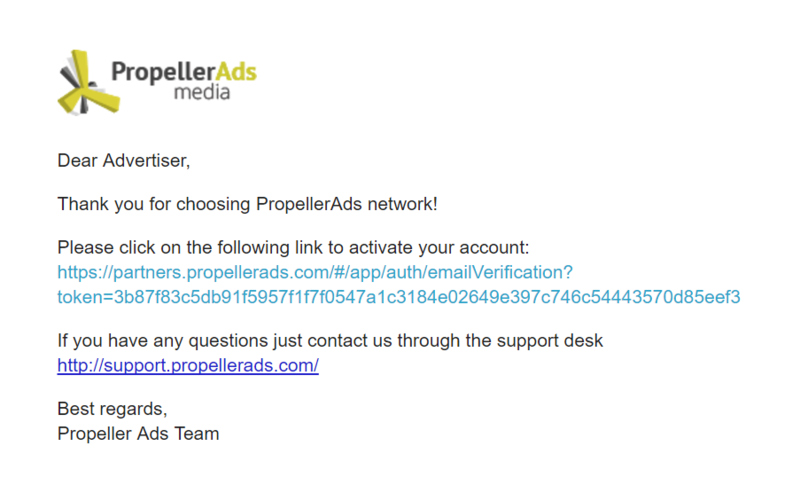 Find the email from PropellerAds in your inbox and confirm your registration by clicking on the confirmation link. Can’t find the confirmation letter? Click "Resend", and don’t forget to check your Spam or Promotions (Gmail) folders. If that doesn't help, submit a request to our Help Desk or contact our Support Team via email. 9. After you confirm your email, you will be redirected to the password creation page. Use our tips to create a secure password, confirm it, and hit "Finish and login". That’s it, you’re now a PropellerAds advertiser! The only thing left to do is fund your account and create your first campaign.